UNDER CONSTRUCTION – A rare opportunity to live in an award winning Campi Developments executive home. 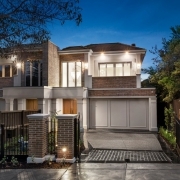 Masterfully designed and appointed and in a prime position just a short stroll to Templestowe Village shops, cafes and public transport. Your choice of 2 Bed /1.5 bath town homes or 3 Bed /2.5 bath configurations with bedrooms upstairs or downstairs plus option of study. Some homes with their own superb street frontage. Perfect for couples, Investors and downsizers seeking this exciting and convenient lifestyle.